With some Champlain Valley residents being evacuated by boat and the Wesport Marina totally flooded, we’re feeling fortunate that a submerged boathouse and waterfront is the extent of our flooding problems. Although we have our work cut our for us when Lake Champlain water levels drop, another short-term challenge is the super saturated soil. Tilling the vegetable garden has been out of the question, planting more grape vines, fruit trees and shrubs likewise has been suspended lest we drown the roots. Last year, I planted spinach and radishes in the garden in mid-March, and my bride and I had been gorging on succulent baby spinach for weeks by this point. Not so this year. Some onions and leeks wintered over, but nothing new has been planted in the vegetable garden yet. I received a call from Mr. Murphy, the gentleman who — with his son and sometimes his grandson — has done an unbelievable job of maintaining our lawns for the last two years. He wanted to know when to start mowing lawns for the season. He agreed that the ground was far too saturated and suggested we wait a couple of weeks. I agreed. Frankly, I’ve agreed with almost every decision Mr. Murphy has made over the last two years. He’s a lawn master. And a weather master. He keeps track of the forecast and works around it, advancing or pushing back our lawn mowing each week per the rain forecast. And so far we’ve never once had an unmowed lawn for the weekend! And he’s nice as can be, always smiling, always ready to let me in on an amusing story or anecdote. He’s famous in these parts for his tomato plants. He raises many hundreds of plants and then sells them to friends and neighbors, donating the profits to the local animal shelter. Actually, today I took matters into my own hands. Despite the notion that a couple of dry weeks would be needed to till and plant, I jumped the gun. Rising lake water had gotten its talons into my spirit, so I decided to ignore the flood and enjoy the first balmy spring day in a while gardening, pruning, landscaping. And you know what? It worked! I only wish I’d tried this approach a few days ago. Maybe Lake Champlain wouldn’t have risen so high. Doug and I spent part of the morning changing over the tractor from snow plow to backhoe, and then proceeded to rip out a lumber retaining wall at the southeast corner of the old clay tennis court. I suspected that the area contained objectionable refuse (a battery and part of a garden hose had floated to the surface) and the wall had been built altogether too close to the carriage barn resulting in sill and framing rot. I’ll tell the story of what we discovered in another post. Then we tilled the garden under for the second time, adding plenty of sphagnum moss to help lighten the soil. We were premature. The tines clogged repeatedly, but we made it through which will help the soil dry out. Tomorrow I’m hoping to make another pass and possibly — I dare not pronounce my wish lest I tempt the rain fates — just possibly I’ll be able to plant some spinach and kale. I’d hoped to have the vegetable garden so much further along by now because of some ambitious plans. We’re relocating the asparagus patch from south of the carriage barn to back by the vegetable garden. The strawberry beds will also be moved. And the rhubarb. And blueberries, raspberries and blackberries are arriving in a couple of weeks to be planted. None of these beds have been prepared yet. We knew it would happen sooner or later. But like so many inevitable but dreaded events, we’d wrapped ourselves in a warm comforter of denial. And four springs slipped quickly past since purchasing Rosslyn without the boathouse getting flooded. Sure, we’ve had plenty of high water, but the water’s never risen above the floorboards. In fact, the highest it had ever gotten was about 9-12″ below the floorboards! Most of the drama surrounds the boathouse, especially since we’ve worked long and hard to restore it to health and happiness. But the waterfront is another big concern. Major erosion already, and that’s with relatively light wind and minimal wave action. Big wind and big waves could be catastrophic! Hoping against hope that the wind will remain calm and the waters will fall. Help me hope if you’ve got psychic horsepower to spare. Although we haven’t finished landscaping the entire waterfront, roughly a third (about 80′) looked great up until a few days ago. We’ve rebuilt the stone walls and planted a lawn on the terrace above the beach. The rear edge of the lawn, following the base of the next stone terrace had grown into a handsome daylily bed that stretched the full eighty feet. Spectacular in summer. Now virtually erased by drift wood grinding and churning in the waves. All hand planted. All pampered through the first season. All healthy and thriving earlier this week. All gone now. Memories. I can only hope that some of the bulbs are intact, floating around Lake Champlain, and that they will wash up on people’s beaches and surprise them this summer with heirloom blooms! At 8:13 AM I received an email and text message from Lake Champlain Transportation notifying me (and all other ferry-watchers) the inevitable. I can’t say that I was surprised. After all, I took the ferry from Essex to Charlotte yesterday morning and returned from Charlotte to Essex about 6 hours later. Although the weather yesterday was spectacular, the water had risen a few inches in the time between my two ferry crossings. I commented to my bride last night that the ferry wouldn’t be running for long. Of course, if the ferry dock is under water, then Rosslyn boathouse isn’t far behind! As of mid-morning today, the water had risen about 6″ above the floor boards. I’ll be posting some photographs soon. Of course our fingers are crossed that the flood has crested, but a glimpse at the weather forecast — plus factoring in how high the rivers are running — and the odds are that we’re going to see Lake Champlain’s water level rise further. The good news? So far the winds have remained low, minimizing boathouse damage from large logs and other flotsam surging against the dock, railings and walls. According to this USGS data for Lake Champlain we’re making history. To be more precise, Lake Champlain’s water levels are making history. That red line at the top of the graph is the historic high water mark set during spring flooding on April 27, 1993. And, as you can see, the blue “actual” recordings have already flickered above the red line a couple of times, though — as I understand it — these figures are not official. Yet. Not sure why. Nor when we’ll know the official water level, but I can assure you that Rosslyn boathouse is now swamped. And the lake is virtually windless and flat… Imagine what this afternoon will look like if/when the wind climbs into the high teens as forecast! Fortunately there’s less debris floating around the boathouse today. I’m worried that heavy wave action combined with a large floating log or two acting as a battering ram against the boathouse superstructure could be devastating. We’ve witnessed the damage already when the water level was 18″ lower. I’ll head down when the rain abates to take some more images of the drowning boathouse to share with you. Until then, please send dry, windless vibes Essex-way. Thanks! This spring one of my gardening priorities is developing the long term fruit production. I’ve spent the last couple of years salvaging long abandoned apple trees, and this spring I’m planting additional fruit trees, shrubs and vines. Sounds factory farm-like… Not at all what I’m gong for, so let’s start again! On March 28 I placed an order with Double A Vineyards for two Neptune grapevines (a seedless white grape variety) and two Reliance grapevines (a seedless red grape variety). Taking advantage of today’s beautiful mid-70’s weather I planted all four grapes along the garden meadow fence, filling in some of the gaps between the grapes I planted last year. The grapes arrived at the end of last week, but I was unable to plant them before heading down to Montclair, New Jersey to celebrate Easter with my in-laws. Fortunately the grape vines were well packaged in damp, shredded newsprint wrapped in plastic. I left the package sealed in the carriage house to avoid drying out the roots, and they were still damp (but not moldy) when I opened them up today. So, why’d I pick these two grapes? Why not! Actually, all of the grapes I’m growing are primarily table grapes (as opposed to wine grapes) and because it’s a lot more enjoyable to eat seedless grapes, I’m mostly narrowing my variety selection to avoid seeded grapes. Although I may later add in a small wine grape vineyard, my short term priority is food, not wine. We planted a vineyard of wine grapes in Rock Harbor in the mid-1980’s and it’s done surprisingly well over the years. Unfortunately wine productions has been limited by the incredible efficiency of the wild turkey and deer who consistently gobble the crop as each variety ripens. I do have a few bottles of our own foxy Dry Gulch Vineyards wine in the wine cellar, and I’d be remiss not to offer a hat top to my parents who actually made two delicious wines last fall, one a lively red from a wide range of grapes from the vineyard supplemented with plenty of native wild grapes. The second was a popular dry apple wine made from fruit purchased at one of the orchards in Peru, New York. I’m meandering. Back to Neptune and Reliance. 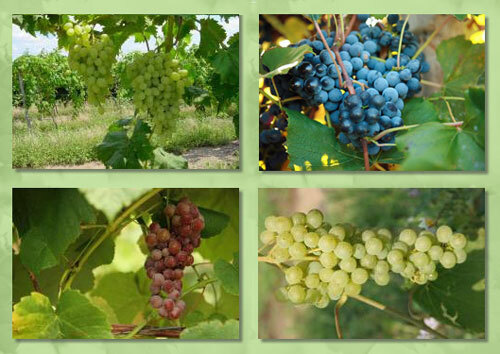 I chose these seedless grape varieties to supplement the existing grapes I planted last spring: Himrod, Catawba, Concord and Mars. According to the good folks at Double A Vineyeards, Neptune/101-14 (Seedless) will afford us a not-too-late crop of super sweet fruit! And Reliance, another mid-season ripener, also offers a sweet alternative to some of the tart fruit I’ve already planted. And melting flesh! Rain is predicted for the next few days. Heck, with the exception of this weekend, the forecast for the next ten days is rain, rain, rain! So while Rosslyn dock house submerges, the grapes will prosper. There’s always a silver lining!